After an exciting touchdown run, it is refreshing to see so many professional football players kneel to the ground to celebrate their success with a quiet, reflective moment. It’s a real contrast to the vibrant, ego-centered rampages we saw during most of the 1990s. Backslapping, head-pounding, and high strutting has its place and reward, but blessed are those who acknowledge the success they’ve achieved without making a mockery of the game. Excessive celebrations often bring unnecessary delay and incur deep resentment and bitter criticism from the opposing team. Finally, in 1998, the league said enough is enough! Let’s put the emphasis where it belongs – on good sportsmanship and grateful hearts – instead of on those few players wishing to show off their latest dance moves. When I reflect upon who God is – how He is so powerful, infinitely holy, sovereign, mighty, majestic, glorious – all I can see is my own sin and how ordinary I am. If we’re humbled before the true God, we’ll have the same response as these disciples. When people face the holy presence of God in their lives, the natural response is to become fearful. But God does not leave us cowering in terror. Dear friend, while respecting the power and might of God, remember His great love and gracious heart. [tweet this] The first step to humility is to understand our sinfulness and ask for forgiveness. Christ showed us humility by becoming a man and living as a servant. Let’s humbly serve others then, in a Christlike manner. Next time an athlete takes a moment to give some quiet reflection to God for His goodness, let’s give that person an extra hand. 1. 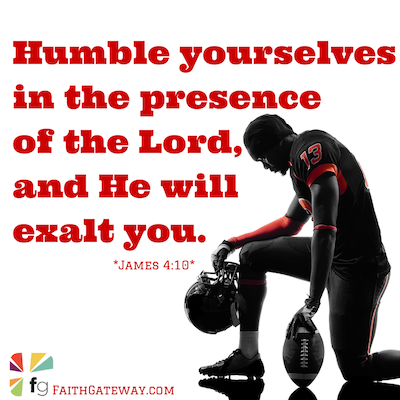 Are there times in your daily life when it would be better to react with humility rather than prideful self-appreciation? 2. How does your humility – or lack of it – affect the attitudes of those around you? Excerpted with permission from Guts Grace & Glory by Jim Grassi, copyright Thomas Nelson, 2013.